Jakarta Maritime, Agriculture and Food Security Agency continues to conduct guidance and provide a special room for the orchid farmers, including orchid sellers.
" Many are buying, as we have many types of orchids, especially also cheap"
Its location looks shady, as near the Ragunan Zoo (TMR). So people who want to see and buy the orchid, you just need to walk around 300 meters from Ragunan Terminal towards Ragunan GOR. There are various orchid sold, starting from dendrobium orchids, panda orchids, moon orchids, douglas orchids and anthurium flowers. They are put in each plot as wide as 80-100 square meters. 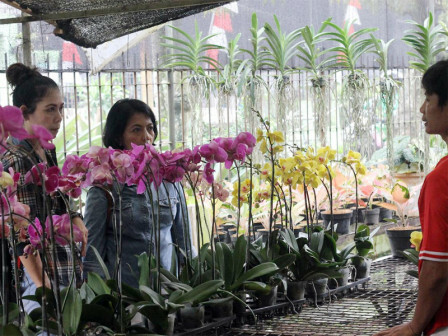 One of orchid sellers, Santi admitted that this Ragunan Orchid Park belongs is already familiar among orchid lovers. Most buyers are from Jakarta, Depok, Bekasi, Bogor until East Java. "Many are buying, as we have many types of orchids, especially also cheap," she expressed, Wednesday (3/27). In details, the price is varied, ranging from Rp 25,000-Rp 120,000, depending on its types and sizes. One of the visitors, Rosiana (47) admitted that this place has been her subscribe. Moreover, the quality of orchids sold is very qualified. "I don't just buy flowers, but also fertilizers and pots. The seller is also answer if asked how to care, so you can get the knowledge too here," told a citizen of Cinere, Depok. Promotion and Processing of Agricultural Products Executing Unit, Tono Hartono explained that the farmers who are also sellers are trained from the service. And Ragunan Orchid Park is open every day from 9 AM-5 PM. "Anyone can come to see or indeed want to buy orchids. The important thing is to maintain cleanliness here," he said.